...Boutique time! Holiday House Boutique and Boise Hunter Homes are proud to present a Fall Harvest Boutique, taking place September 24-25 in Saguaro Canyon at 846 E. Pasacana, Meridian, Idaho. If you're looking for unique, locally-handcrafted items, this is the place to find them! And we want to welcome Fleurish Photography to our family of vendors this year. 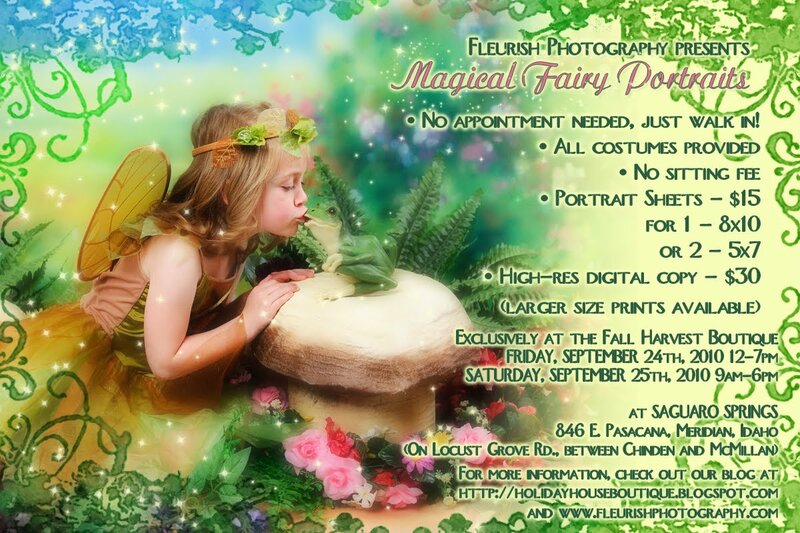 Fleurish will be setting up a studio within the boutique to offer her unique "Magical Fairy Portraits". If you have any little princesses at your house, you won't want to miss this opportunity! It will be truly "magical!" Mark your calendars and plan on joining us--we'll see you there!